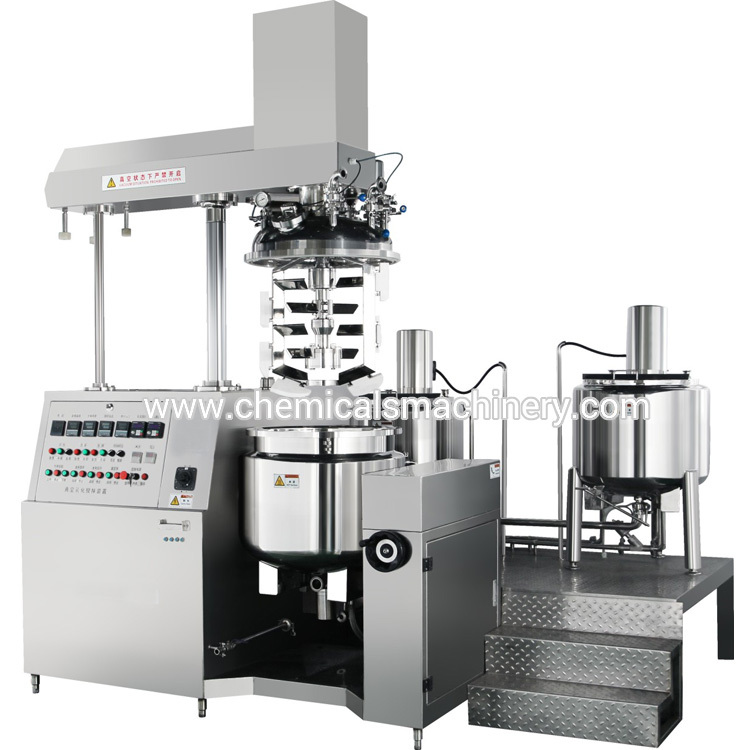 Vacuum pharmaceutical cream emulsifying mixer is professionally designed based on the cream and ointment manufacturing process of cosmetics and Pharmaceuticals etc. 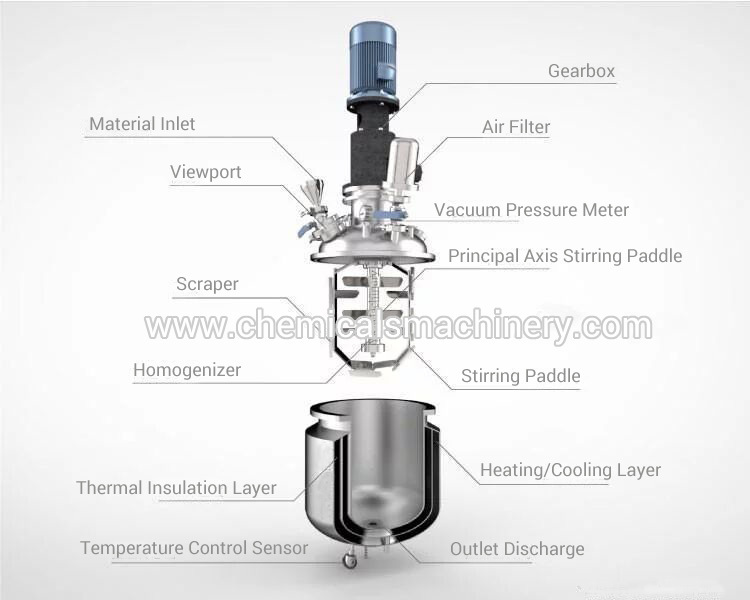 The emulsifier machine consists of pre-treating pot,vacuum emulsifying and blending pot, vacuum pump, hydraulic lifting system, dumping material system, electric heating or steam heating system, electric control system and working platform etc. The emulsifying mixer is featured by easy operation, stable production performance, good homogenizing performance, high production efficiency, easy to clean, reasonable structure, less land occupation and high degree of automation etc. Mixer motor adopts advanced frequency converter for adjusting working speed, which could meet different technological requirements. The homogenizing Structure is introduced German technology, the maximum emulsifying rotation speed reaches 3000rpm and also the greatest shearing fineness can achieve 2-5um. The Vacuum defoaming could make all the materials have the advantages of being aseptic at a vacuum status. And particularly for that powder materials, it can avoid pollution when material enters into the blending tank. The pot cover of emulsifier adopts hydraulic lifting system to make sure easy and high-efficiency cleaning, product discharge could be bottom discharge or tilting discharge. Using stepless speed stirring, making the speed of blending line adjustable to meet the different technological requirements. Adopting ROSS company technology from United States advanced homogenizer, unique structure and superior efficiency. Made of imported stainless steel 316L material for the material contacted parts, the inner surface of vessel with mirror polishing 300 EMSH which reaching to hygiene grade. Vacuum material sucking and vacuum defoaming, the entire process is completed in a vacuum status,no cells contaminated, product shelf life is extended. Elegant appearance of machine with special polishing technology, shiny as a mirror, displaying even more luxuriously. 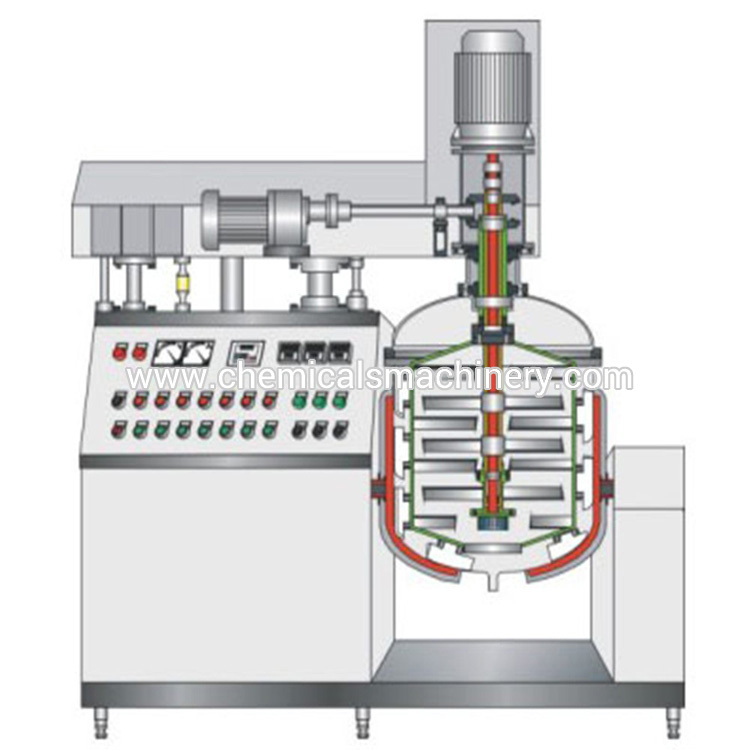 The vacuum homogenizing emulsifier is also used in the below industries.